PowerPDF is featured on igeeksblog.com article: http://www.igeeksblog.com/create-pdf-files-on-iphone-ipad-with-powerpdf-pro/. ComcSoft announces the availability of iTransfer App on App Store. The iTransfer App is another addition of powerful apps in ComcSoft’s utility suite. iTransfer provides easy file transfer management for iOS users. It supports file, photo, music transfer to/from Dropbox, FTP/SFTP servers and websites. iTransfer is free to download and $2.99 to upgrade to Full Version. iZip 6.0 is the latest release from ComcSoft. It greatly improved the user’s experience through completely redesigned UI and more powerful compression/extraction libraries. Users can learn more from the iZip web page by visiting here. ComcSoft announces the 1.0 release of iNetTools on Apple App Store. iNetTools is a suite of network diagnose tools, including Ping, DNS Lookup, Trace Route, and Port Scan. iNetTools runs on both iPad and iPhone. iNetTools is free to download. The free version comes with all features and has an Ad banner at the bottom of the screen. Users can also pay $2.99 to upgrade to the Full Version, which removes the Ad banner and upgrade prompt. iZip 6.4 is now iPhone 5 compatible. Added file deletion by swiping on the row. Added 10 more languages in iTunes Connect. Added Tutorial videos in About iZip. Added Portrait Mode in File View in the Paid /Pro version. Fixed an issue of MP3 playback in Pro Version. 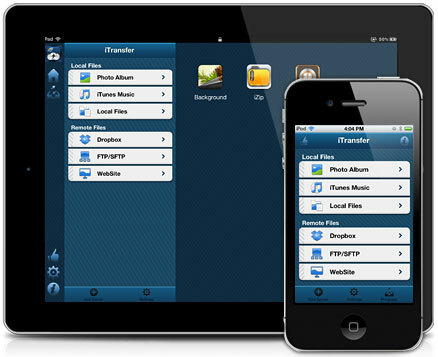 With its simple interface and powerful library, iZip is a must have utility on your iPhone and iPad. - Supports many image formats, including: PNG, JPG/JPEG, GIF, BMP, TIFF. - Supports conversion to PDF and GIF from your Photo Albums and Local Photos. - Supports photo processing features including: cropping, size adjustment, rotation, color adjustment, and special effect filters. - Supports Special Effect Camera with many filters. - Supports GIF Camera and GIF creation. - Supports batch photo processing features including: conversion, email, size reduction, printing, and saving to Camera Roll. - Supports photo sharing on Facebook, Twitter and Weibo. - Supports photo slide shows. - Supports to open a photo in another App through “Open In”. - Supports to import files from your Camera Roll, Email or another App. 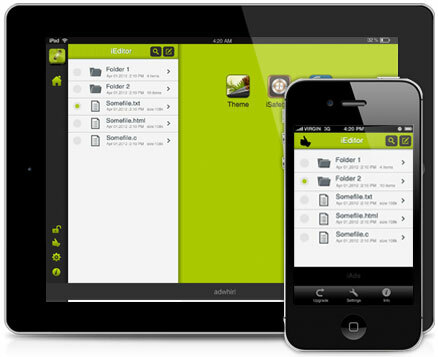 - Supports file management features including: rename, deletion, move, folder creation and sorting. - Supports keyword search on Local Photos and Camera Rolls. - Supports to open many file types, including: PDF, DOC, EXCEL, PPT, TXT, image files, and audio files. With its powerful image processing and file management tools, Power Photo provides the easiest way to manage and process images on your iPhone and iPad. Converts supported files to PDF. Supported files include: DOC, XLS, PPT, TXT, RTF, XML, HTML and all text files. Scans to PDF using your Camera. Splits a PDF file into two or more files. Deletes one or more pages from your PDF. Adds password protection to your PDF. Views PDF in thumbnail or full screen modes. Navigates to different pages within PDF. Zooms in/Zooms out on PDF. With its powerful PDF processing and file management tools, Power PDF is the must-have App on your iPhone/iPad. PowerPDF has three versions: the Free Version is available from App Store: https://itunes.apple.com/us/app/powerpdf-pdf-viewer-editor/id592355306?ls=1amp;mt=8. The Full Version is available through In-App purchase within Free Version. A Pro Version is available from App Store: https://itunes.apple.com/us/app/powerpdf-pro-pdf-viewer-editor/id592358758?ls=1amp;mt=8. Today ComcSoft announced availability of another great App PowerReader on Apple App Store. Open and view many document types, including: DOC, EXCEL, PDF, PPT, RTF, HTML, images, videos and mp3 files. Read EPUB and TXT eBooks in Book Reader. Add and manage Bookmarks on eBooks. Enable different viewing settings on eBooks, including: font, brightness, themes, day/night modes. Auto play eBooks with speed setting. Add and manage documents in your favorite file list. Open documents from your recent file list. Import files from your Camera Roll, Email or another App through “Open In”. Manage Files including: rename, delete, move, create folder and sort. Open a document using another App. With its simple interfaces, PowerReader provides the easiest way to read documents and eBooks on iPhone and iPad.